Thirteen Gefen Digital Signage Creators were used with 13 Samsung flat panel displays strategically mounted with hardware from Chief Manufacturing throughout the lobby of the DCPA. DENVER, CO—Nestled within a four-block, 12-acre Performing Arts Complex in downtown Denver, the Denver Center for Performing Arts (DCPA ) encompasses a wide variety of theatrical offerings for more than 750,000 patrons. The Tony Award-winning Denver Center Theatre Company, Broadway musicals presented by Denver Center Attractions, and a top-quality Theatre Academy cast a wide net among local and regional participants interested in professional and amateur theatrical offerings. 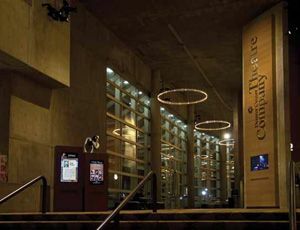 To expand upon the theatre’s ability to communicate with this growing audience, highlight sponsors and promote performances to attendees when spending time in the lobby, the Bonfils Theater Complex at DCPA appointed Howard Steele of Technology Plus Consulting with the task of specifying a lobby digital signage project. Steele made contact with Cliff Wernet, western regional manager for audio/video distributor BTX, who demonstrated the new Gefen Digital Signage Creator (DS C) for the project, offering in-depth follow-up training via WebEx. Gefen DS C’s intuitive layout program works with all Windows programs and enables users to record and upload video, select music, pull RSS feeds or live video streams off the internet and layer all content to build a totally customized theme. Users can select from a host of pre-loaded templates for an immediate solution or spend time building a totally unique visual program as they see fit. The software is designed to be easy to use, while offering advanced functionalities to enhance audio/video displays. It offers built-in scheduling and calendar functions so users can prearrange content to play down to the second. Steele specified 13 DS Cs to be used with 13 Samsung flat panel displays strategically mounted with hardware from Chief Manufacturing throughout the lobby of the DCPA . Local installation specialists CEAV CO Audio Visual performed the installation. To blend flawlessly into the environment, many of the displays were mounted flush with the wall, mimicking a poster-type display with all the features and functions of 21st-century digital signage enabled. Others were built into custom kiosks outside of each theater entrance. Thirteen individual DS Cs, one per display, were mounted inconspicuously behind each display, requiring very little power (less than 2 watts) and running cool.